after I finished the Saracen some days before Christmas I was looking for a new and quite "simple" project to start 2012 properly. After a short time I found the right model in my box: the Sagitario-bust from Yedharo Models (sculpted by Fausto Gutiérrez). It was a small present from Roman after his return from Monte San Savino. Right before Christmas I was in Berlin for a qualification test and stayed two days at Mati´s place. 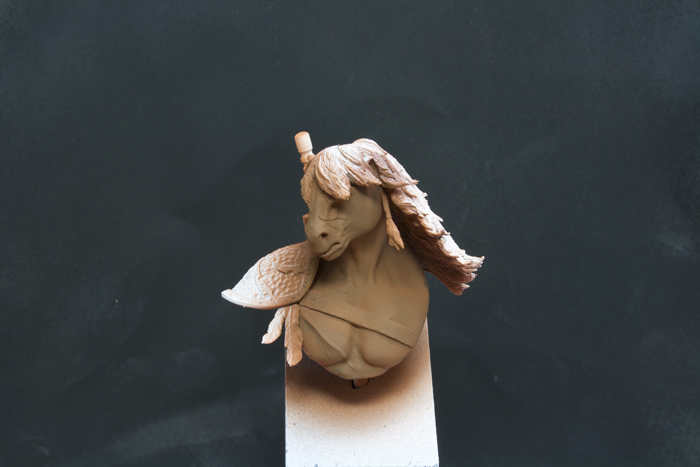 Here I wanted to prepare the bust for painting. I just thought to make some minor improvements, but Mati had a much better vision and simply resculpted big parts of the bust. 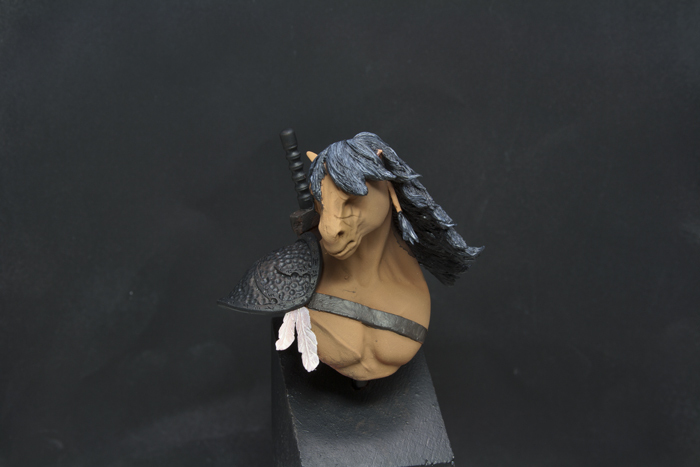 The result was a completly new version of a horseman... a battleproved horseman warrior... a version I liked even more than the prior Indian influenced version and I was eager to start the paintjob... so at this point a special thanks to Mati for his big influence! I thought the small bust would be the right opportunity to try my new airbrush and to get some important experiences in handling it. Doing the shades/darkest colours with the airbrush first is not the best way to start the miniature. As you see on the last picture the basic shade-colour is hardly to be seen on the bust anymore. In real you can see it still a little bit, but in fact I could also had skipped all the steps and started right with the last colour... well I tried and learned ;-) next time I will do it the other way! After cleaning the airbush, it was time to use the good old brush! 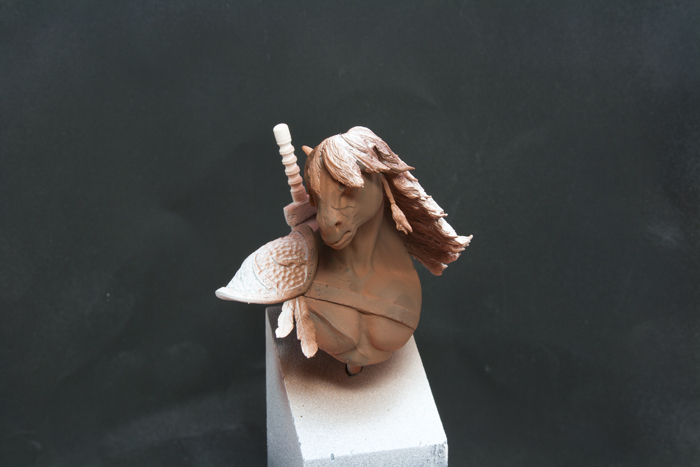 As you already see on the last picture I started by giving every part of the bust its basic colours. 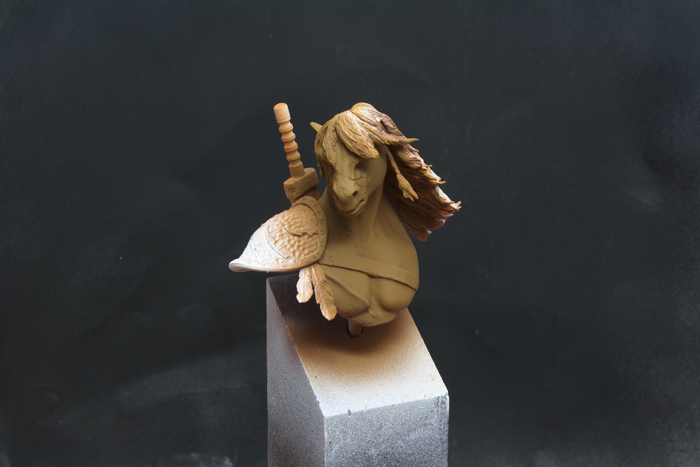 As I learned from Roman in the last years, it´s very assistant for further painting to have the basic colours everywhere on your miniature before you continue. 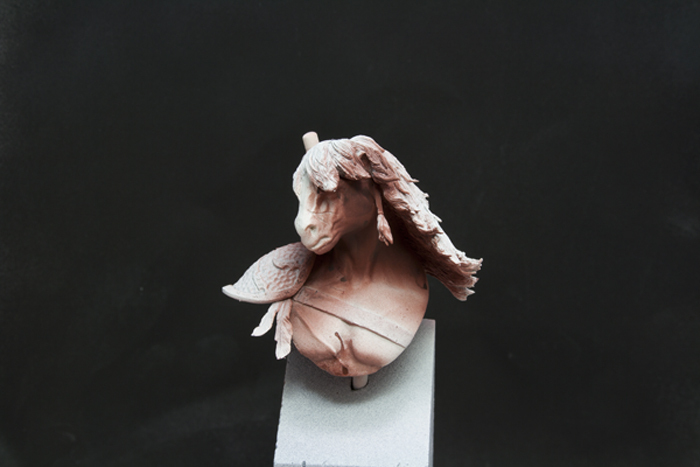 It helps you to get an idea in which direction your miniature is developing and how the different colours work together (hope you understand what I mean). The metal-parts were painted in black (as a basic), the leather parts in a mixture of Dark Angels Green (GW) and Scorched Brown (GW), the hair was painted "wet in wet" with black and grey. While painting the hair I tried to highlight the more dominant streaks while the rest should stay darker. After doing the basic work on the miniature, I focused on the skin. The most important thought here was to give the skin some more intensive colour, as it has gone quite pale during the last step with the airbrush. So I used layers of Bestial Brown (GW) to intensify the skin-colour. The metal-parts were painted with Tin Bitz (GW). If you compare the last two pictures you see that a lot happend with the skin-colour. After the last step the skin was quite orange, without any highlights or intense shadows. 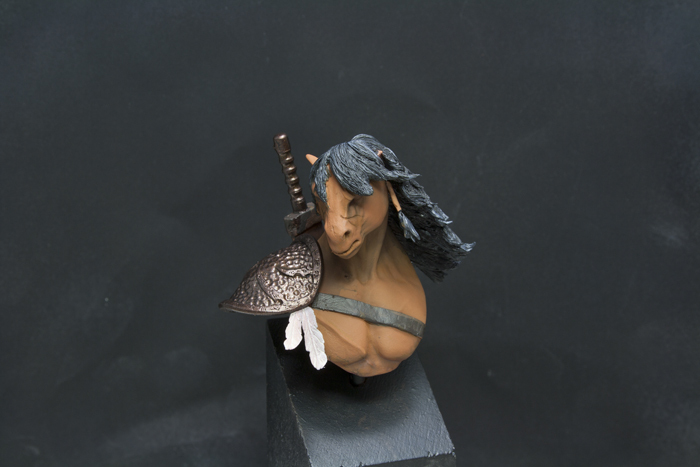 To give the horseman a more natural skin-tone I used Bestial Brown (GW) and added Dwarf Flesh (GW) in smaller portions to work out the brighter parts of the bust (you can still see some orange on the cheek). As soons as there appeared any "unclean parts" in the blending, I used layers of the middle-tone to smooth these parts. For the snout and the forehead (brightest parts) I added a tiny amount of yellow to my colour. If you would only use Dwarf Flesh (GW) and white for the highlights the bust would look "chalky" and unnatual (thanks to Roman for the hint). To prevent this, add some yellow and afterwards (if needed) some white. The shades here are quite rough as I focused primarily on the brighter parts. I mixed Bestial Brown (GW) and Scorched Brown (GW) to define the shades and added some Dark Sea Blue (Vallejo) to intesify them. In the next steps I will smooth these parts. The scars are quite simple: I painted the basics with Dark Flesh (GW), added some Scab Red (GW), Dwarf Flesh (GW) and finally Elf Flesh (GW) to make them look like on the picture. The leather changed just a little bit: I painted some small scratches with Ivory (Vallejo) and used some Inks (Devlan Mud (GW), Smoke (Vallejo), Sepia (Vallejo)) to make it look like old, used leather... but there is still a lot to do till it is finished. Click here for Roman´s tutorial for leather! Danke dir Peter für den tolles post. Und natürlich danke an Kaiser Roman und König Raffa. 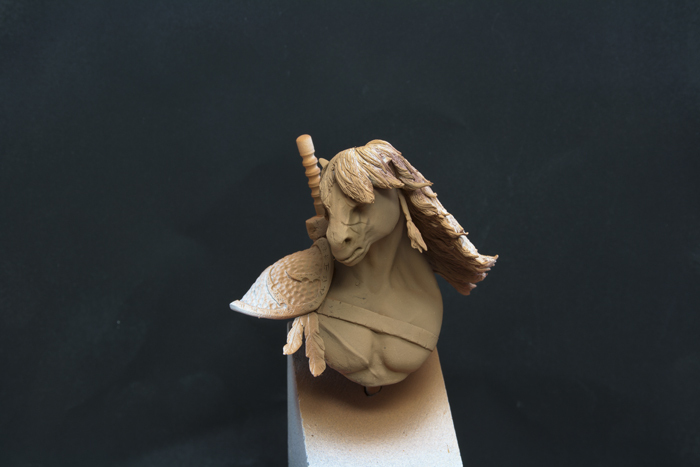 "...it´s very assistant for further painting to have the basic colours everywhere on your miniature before you continue.It helps you to get an idea in which direction your miniature is developing and how the different colours work together(hope you understand what I mean)." Thank`s a lot Peter. Very helpful for me!!! Bravestarr! But seriously great job and excellent W.I.P! Thank you. 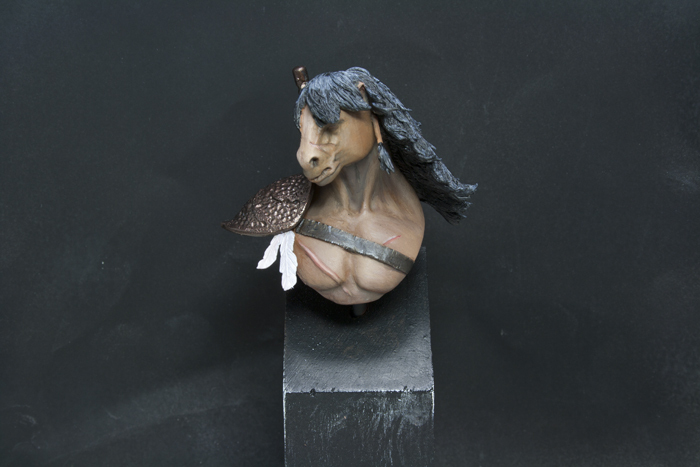 so you managed to paint a horseman-bust before I did :D , turned out great. 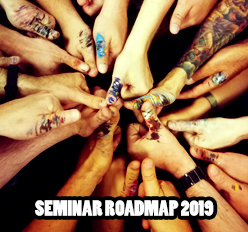 As for airbrush: I think you were too heavy handed with it(too much color even at the first pass) and you tried to use the traditional brush-way (dark->light), while the airbrush is best if going toward the shades and being more and more careful. The other way around it's not really the best. Many thanks to you, Peter!